Wild Caught or Farmed Fish? : Does it Really Make a Difference? Wild Caught or Farmed Fish? 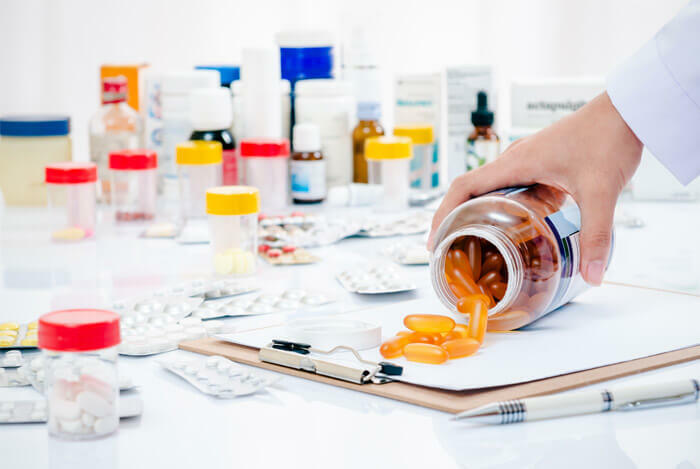 : Does it Really Make a Difference to Your Health? 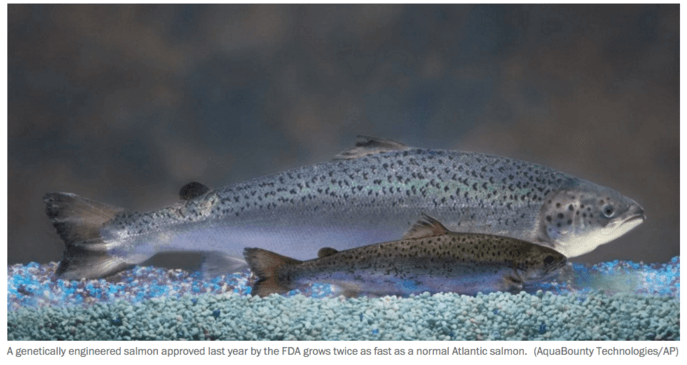 During November 2015, the FDA decided to approve the use of a genetically modified salmon. This GMO salmon would only take 18 months to grow to full size instead of 3 years. Plus, this Frankenstein creation would be much larger in size than a wild caught salmon! While that seems slightly scary if you’re against genetically engineered foods, the worst part is that most of us weren’t even aware of this happening until the FDA banned its use. See, originally the FDA approved this genetically engineered salmon for human consumption, but it soon rescinded its decision based on the fact that it wasn’t exactly sure how to label this new fish. So until then, sales of the GMO fish were strictly prohibited. Unfortunately, the process of using genetically modified fish is still in motion, it just hit a tiny roadblock. On the other hand, fish farming has been around for several years—and it’s going to see a boon in business thanks to GMO fish. According to its creators, genetically engineered fish need to be farmed on land instead of in the ocean (of course, they would be in tanks on land). This is because escaped salmon could pose a danger to the natural wild species of salmon if they were to reproduce together. Keeping all this in mind made me wonder: Are farmed fish taken out of their natural habitat and engineered to grow bigger and faster just as good for our health as wild caught fish? Are they even safe to consume at all? I’ll answer these questions and more in today’s article. By the end, you’ll have a science-based answer about whether farmed fish is just as healthy as wild caught. Why Farm in the First Place? 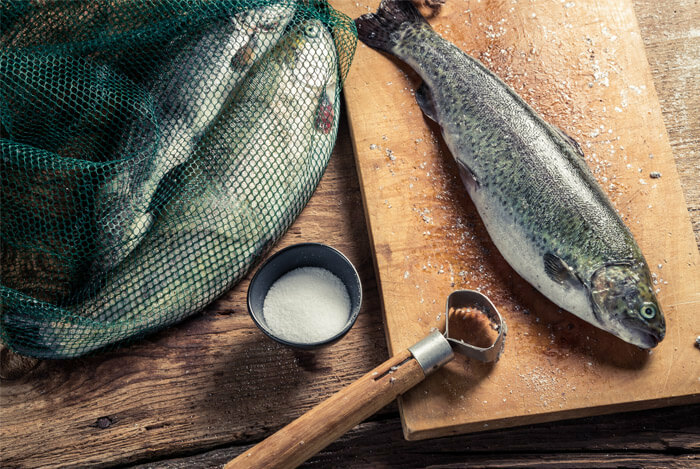 Is Farm Raised Fish Just as Healthy as Wild-Caught? 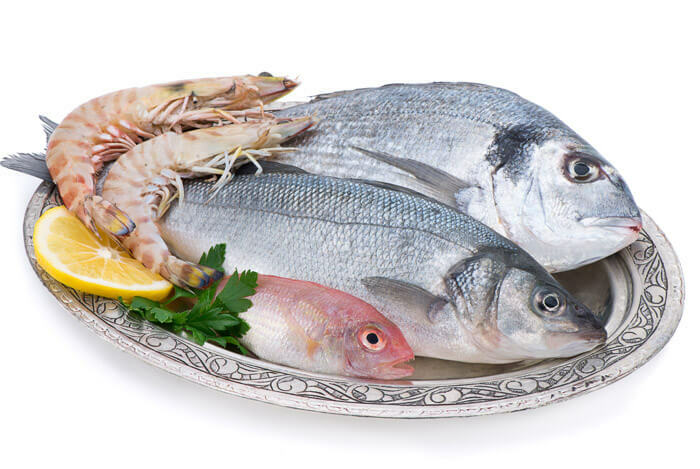 Most of us know that fish are one of the tastiest and healthiest foods in the world. This is due to the fact that they’re packed with healthy omegas, protein, and essential nutrients such as iron and vitamin D. Most varieties deliver all of this for a small amount of calories per serving. 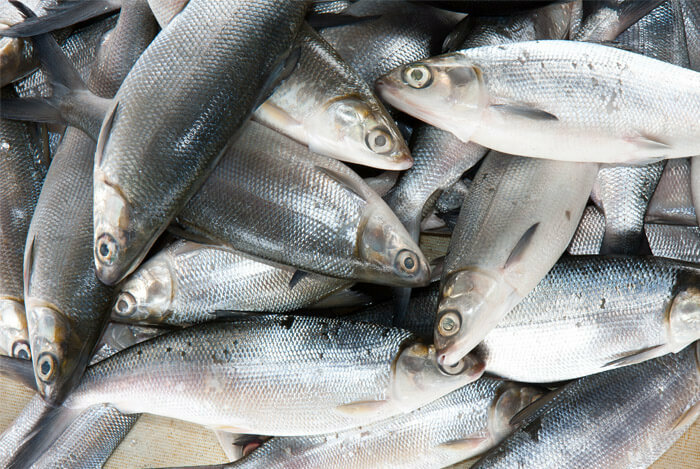 Once this diet-friendly news became mainstream, our demand for fish skyrocketed. As a result, overfishing became the norm. The problem is that species such as salmon can take years to reproduce. This means that when we overfish, it takes a long time for fish inventory to be replenished the natural way. This is time the fishing industry just doesn’t have. So to combat the issue, fish farming was introduced and is still heavily relied upon today. As the name suggests, farm-raised fish are raised on land in massive (and sometimes overcrowded) fish tanks similar to how land animals are confined when they’re bred for consumption. So almost half of our fish consumption was farm-raised fish instead of wild caught. What kind of effect was this new shift in eating having on our health? One would assume that if the regular, non-GMO fish raised in farms had the same genetic makeup as those living in the wild, they should have exactly the same health benefits for us, right? When fish are raised in these farms, they’re no longer eating a natural diet like what they’d have in the wild. Instead, they feast on commercial feed. These commercial feeds are specifically made to cut costs—some have as many as 19 different (and approved!) genetically modified ingredients in them. They can contain grains, corn, and even meat such as pork or chicken. Not exactly what a fish would find in the ocean. As a result, these fish are not consuming nearly as many healthy omegas as their wild-caught counterparts, if they’re consuming any at all. Researchers have admitted that the omega count in farm-raised fish could be reduced by as much as 50% because of this. 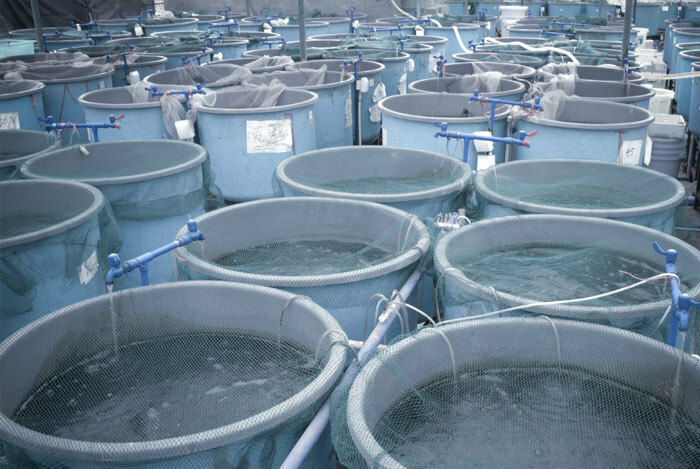 To make as much profit as possible, the farmed fish are jam packed in tanks by the hundreds, if not thousands. The fish don’t have much room to swim and their excrement has nowhere to go. As you can imagine, disease and filth run rampant in these tanks. According to an article in Time, antibiotics must be added to the water to prevent the spread of diseases. 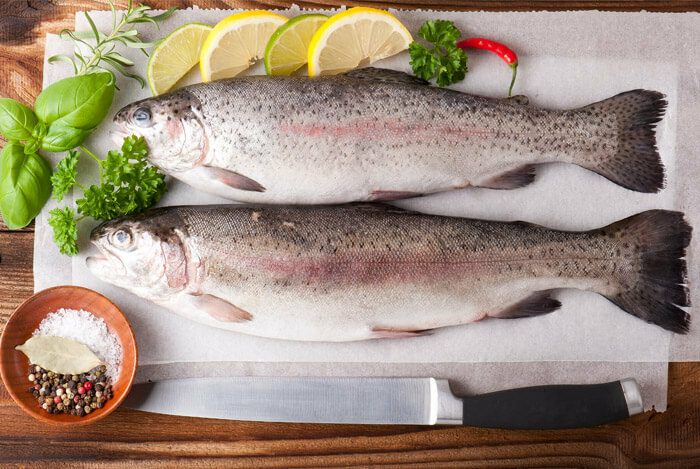 Studies have shown that at least five antibiotics were found in farm-raised salmon, tilapia, shrimp, and trout. When we continually ingest this many antibiotics, we become more resistant to their effects, meaning when we actually need them to work, they’ll be much less effective. So if you’re buying hormone free chicken, but your farm-raised fish has been doused in antibiotics, you’re really not doing your health any favors. Most people assume that since farm-raised fish isn’t raised in the ocean, they’re naturally mercury free. However, this is not entirely correct. See, some fish farms actually exist in the ocean. So they’re not immune to the mercury problems plaguing wild-caught varieties. What’s worse is that these type of farms are located on the shoreline where factories tend to dump their waste runoff (aka cheap land). This waste contains harmful PCBs (polychlorinated biphenyls) and dioxins which get absorbed by the fish and eventually work their way into us. Farmed fish in the ocean are actually being exposed to a greater amount of chemicals than wild-caught fish. They deal with the same issue of mercury, but farm-raised fish can’t swim away from the waste runoff from factories. And they’re also forced to eat GMO feed containing crops like corn and soy which are both exposed to large amounts of pesticides. Yikes! Though better than farm-raised fish, wild-caught fish isn’t the pinnacle of perfection either. 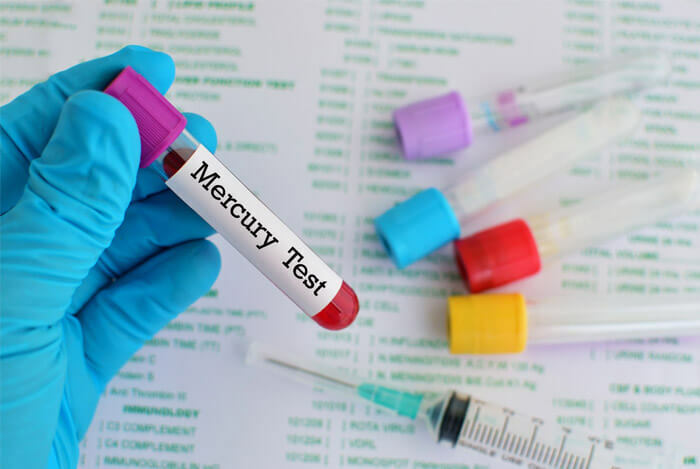 Thanks to heavy factory pollutants being dumped into our oceans, some wild fish contain high levels of mercury and PCBs too. Once these chemicals build up in a fish’s system and we consume them, we’re ingesting those chemicals as well. Instead, choose fish lower on the food chain that don’t take as long to mature. This limits their time of being exposed to the toxins found in their natural environment. 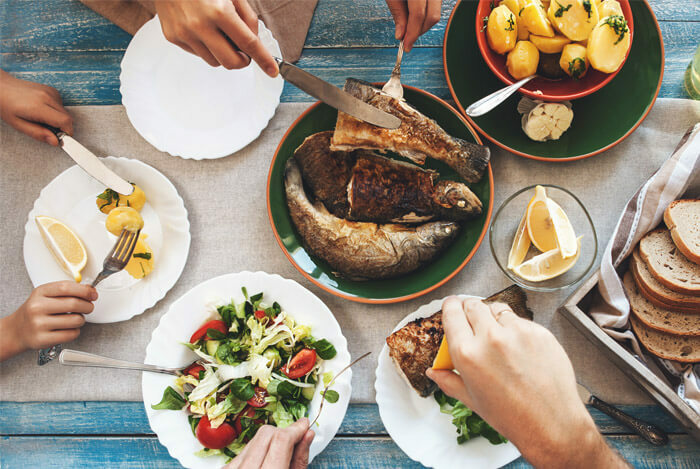 Reach for wild-caught fish such as catfish, herring, pollock, oyster, salmon, sardines, shrimp, and tilapia since these fish don’t absorb as many dangerous toxins. Because fish are so healthy, I don’t think it’s a good idea to completely remove them from your diet. Rather, you just need to be more conscious about which varieties you’re buying wild and which farm-raised ones are okay to eat. Some of the best advice I’ve read on safe farm-raised fish comes from Mark’s Daily Apple. 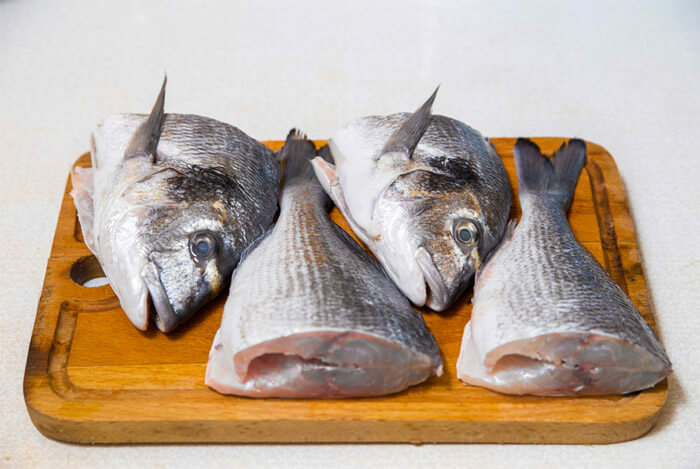 Remember: When it comes to wild caught fish, the key is to steer clear of the “big four” and choose fish lower on the food chain since these are less contaminated. As you can see, there’s no easy answer to solve the farm-raised or wild-caught fish debate. We don’t have a hard and fast rule declaring one type better for your health than the other. Each fishing method has their own set of pros and cons you’ll need to sift through. Your best option is to follow the guidelines in this article whenever you’re unsure of which fish to enjoy. Don’t forget to always choose fish that are sustainably sourced and farmed. This means that the fishing practices can be maintained indefinitely without reducing the fish’s population or negatively affecting the other species in the ecosystem. As I always believe, a healthier environment means healthier people living in it. What did you think about the findings in this article? Were you shocked by anything you learned? I’d love to hear your reaction in the comments!